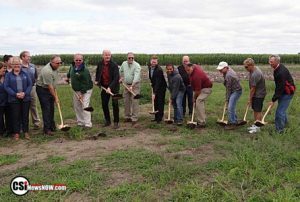 Jamestown (CSi) The groundbreaking for the Jamestown Airport Business Park was held Thursday July 26. The staging area was at Hwy 20 and 17th Street. The park will include 92 acres of lots with 30 acres are dedicated to aviation-related businesses. Infrastructure costs are anticipated to be $2.8 million paid by the JSDC., with the construction of roads, along with water, sewer and street lights possibly starting next week an finished this fall.